Independent Strategy’s latest report, “China’s credit bubble: the missing piece in the jigsaw” makes a persuasive case that China’s debt fueled growth model is due for a hard landing, but the timing is uncertain, since the debt is funded internally. China is barely past an episode of dealing with banks chock full of bad loans (there were debates among Western analysts in 2002 and 2003 as to how bad the damage was and whether the remedies were sufficient). On a more fundamental level, China has copied the Japanese mercantilist development model pretty much wholesale. It arguably hit the wall with the 1985 Plaza accord, when the US found the continued trade deficits unacceptable and succeed in organizing a G5 intervention to drive up the yen (that succeeded too well, the yen overshot, leading to the Louvre accord to push up the greenback). Japan’s central bank lowered interest rates to stoke asset prices in the hopes that the wealth effect would produce higher domestic consumption and offset the effect of the fall in exports. We all know how that movie ended. This piece does a concise job of recapping some of the troubling conditions undergriding the seemingly robust Chinese economy. A particularly striking one is the dramatic fall in the productivity of borrowing. In 2000, it took only 1.5 RMB of credit growth to produce an additional RMB of GDP growth. It now takes 6 RMB of credit to produce 1 RMB of GDP growth. It has become conventional to decry borrowing in the US because it has supported consumption, but debt that supports unproductive investment (factory overcapacity, overbuilding of high end housing, land speculation) is no better. We now know that much of the credit explosion in 2009 that boosted economic growth went into local government entities where it was wasted on unproductive real estate and infrastructure projects. These entities are mostly insolvent and will create huge bad debts for the banks as credit is tightened this year…. China is an economy where bank credit equals 130% of GDP — twice the penetration of peer emerging markets and where credit grew by one-third last year, adding money to the system equal to nearly 40% of GDP…. …the total borrowing of LGFVs [Local Government Financing Vehicles]is Rmb11trn ($1.6trn), which breaks down roughly into Rmb7trn borrowed for infrastructure spending and Rmb4trn for ‘other’ purposes. 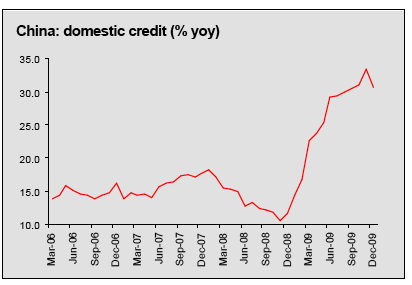 These figures match China’s domestic credit growth in 2009 of about one-third of GDP and go a long way to explaining the credit bubble (we knew about the lenders, but little about the borrowers). LGFV debt is big enough to be a potential source of major macro-economic instability. LGFV borrowing adds about another 30% of GDP to public sector debt; is equivalent to 25% of outstanding bank credit; and more than 80% of new bank loans during the 2009 credit bubble. This hidden debt is equivalent to 225% of bank equity capital, meaning that a loss-given-default ratio of 30% would wipe out two-thirds of existing bank equity. If you add in LGFV debt (and other unconsolidated forms of state credit) to total government debt, China’s gross sovereign debt to GDP is closer to 70%. And remember that 60% of GDP in government debt is the level at which Reinhart and Rogoff estimate that average GDP growth rates in emerging economies will be reduced by 2% pts after a financial crisis. This LGFV edifice will not survive credit tightening, because it is a Ponzi-type pyramid built upon borrowing more to service existing borrowings….the problem is economically huge. LGFVs are not going to be borrowing and spending any more. And if infrastructure investment drove 90% of 2009 GDP growth and 70-80% of this was down to insolvent LGFVs, where will the growth in credit and GDP come from now? The report forecasts a large decline in growth rates, as well as land and real estate prices, since LGFVs will need to liquidate holdings to try to pay off non-performing loans.